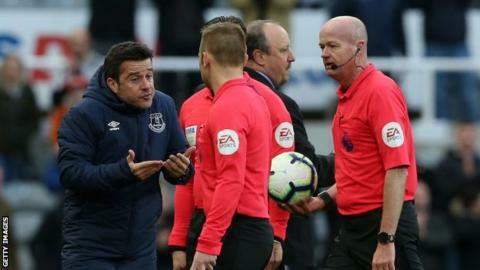 Everton manager Marco Silva has been fined £12,000 by the Football Association for confronting officials after his side's defeat at Newcastle. Silva, 41, engaged angrily with referee Lee Mason and his assistants when his side lost 3-2 - despite being 2-0 up - at St James' Park on 9 March. The former Watford boss complained Ayoze Perez's winning goal was offside. The Portuguese accepted an improper conduct at an Independent Regulatory Commission hearing on Tuesday.